Session Attendance Tracking Made Easy! Put those “Sign-in Sheets” into the recycling bin! Use our technology and start collecting accurate and timely session attendance information. Continuing Education (CE) sponsors are requiring greater accountability and traceability for awarding CE credits and the most cost-effective approach is to leverage our technology to do just that.Barcodes and radio frequency identification (RFID) badges, just like those used for exhibitor lead retrieval, can also be used to track attendee participation in sessions and at various onsite and offsite events. 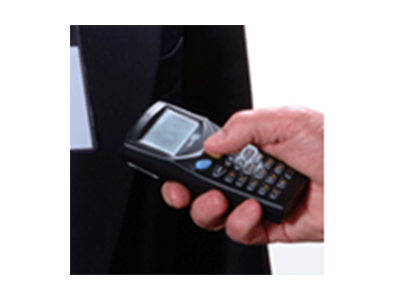 Our mobile and stationary badge scanning systems meet a wide variety of needs, offering several options based upon cost and reporting requirements. Mobile scanners can easily operate for 1-3 days on their built-in batteries. Stationary scanners get their power from the host device (PC or Printer Base Station) to minimize cable and power requirements. We use the same dependable scanner for our handheld 1D Session Tracking as we use for our 1D Exhibitor Lead Retrieval. Our in-house software makes it super easy to scan your session attendees’ badges and download the scanned information to your Windows PC for reporting. We can supply everything you need including training, all the hardware and onsite technical support. 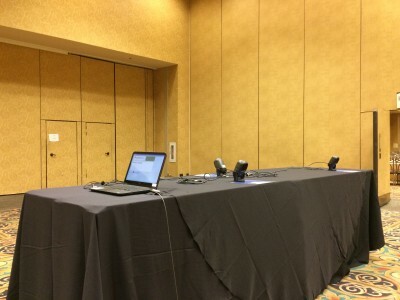 This solution is recommended for rooms / events that host approximately100-200 attendees, depending on the amount of time allowed between sessions. Using our modular system, you can connect up to 10 badge readers to a single Windows PC. This approach will easily track 1,000 or more attendees per room / event, depending on the amount of time allowed for ingress of attendees. Our software is designed for ease of use and is configured for customized reporting. In operation, the title of the current session can be displayed on the PC screen and shared to a larger screen if needed, and is easily changed. The screen can even be used for informative messages between sessions. These stations may be used as stand-alone stations or may be connected via a local Ethernet network to allow for remote operation and monitoring, central data collection and real-time reporting. 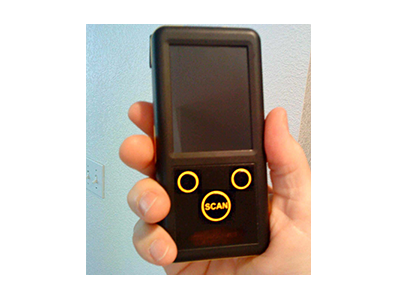 We use the same dependable scanner for our handheld RFID Session Tracking as we use for our RFID Exhibitor Lead Retrieval. The touch-screen interface provides all relevant information at a glance. We can supply everything you need including training and onsite technical support. This solution is recommended for rooms / events that host approximately100-200 attendees, depending on the amount of time allowed attendee ingress. Using our modular system, you can connect up to 10 RFID badge readers to a single Windows PC. This approach will easily track 1,000 or more attendees per room / event, depending on the amount of time allowed for ingress of attendees. Our software is designed for ease of use and is configured for customized reporting. In operation, the title of the current session can be displayed on the PC screen and shared to a larger screen if needed, and is easily changed. The screen can even be used for informative messages between sessions. These stations may be used as stand-alone stations or may be connected via a local Ethernet network to allow for remote operation and monitoring, central data collection and real-time reporting. We use the same dependable scanner for our handheld QR code Session Tracking as we use for our RFID Exhibitor Lead Retrieval. The touch-screen interface provides all relevant information at a glance. We can supply everything you need including training and onsite technical support. This solution is recommended for rooms / events that host approximately100-200 attendees, depending on the amount of time allowed attendee ingress. 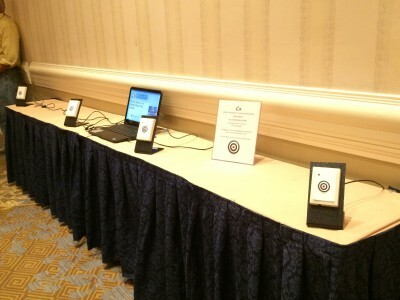 Using our modular system, you can connect up to 10 QR code badge readers to a single Windows PC. This approach will easily track 1,000 or more attendees per room / event, depending on the amount of time allowed for ingress of attendees. Our software is designed for ease of use and is configured for customized reporting. In operation, the title of the current session can be displayed on the PC screen and shared to a larger screen if needed, and is easily changed. The screen can even be used for informative messages between sessions.